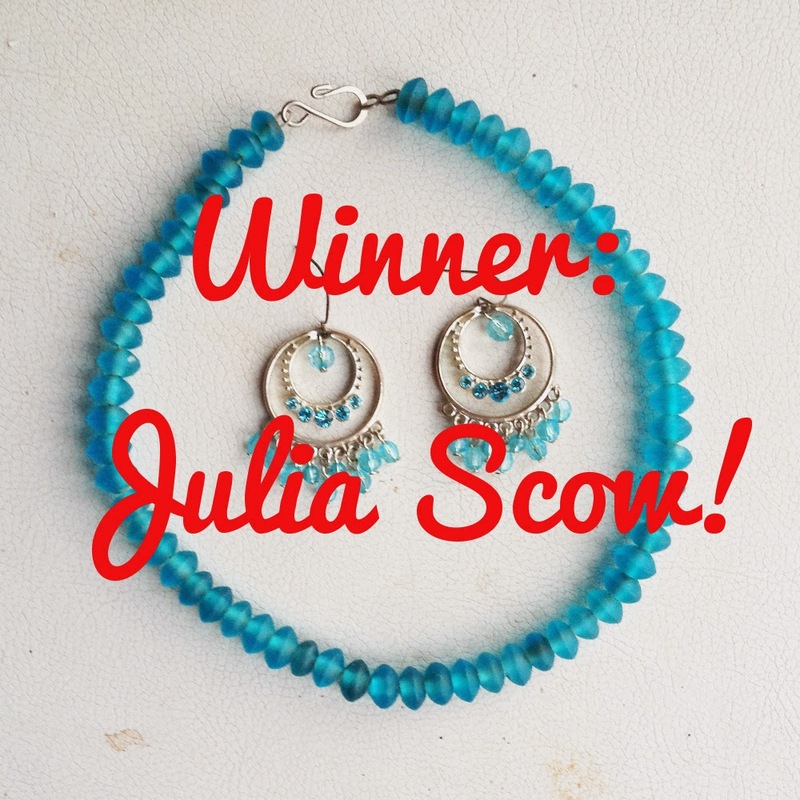 Thanks to all who entered this week's giveaway for a pair of pretty chandelier earrings and a glass beaded choker. The winner was Julia Scow, who entered all kinds of ways — her entry for following me on Bloglovin was the one that the random number gods selected. Julie, email me at bonmarchecouture at gmail dot com with your mailing address and I'll get this out in the mail to you. And, a word of apology to some previous giveaway winners — I have gotten a bit behind in my shipping and I am very sorry it is taking me so long to get you your goodies! A trip to the post office is imminent, I promise. And be sure to check back tomorrow for this week's giveaway. 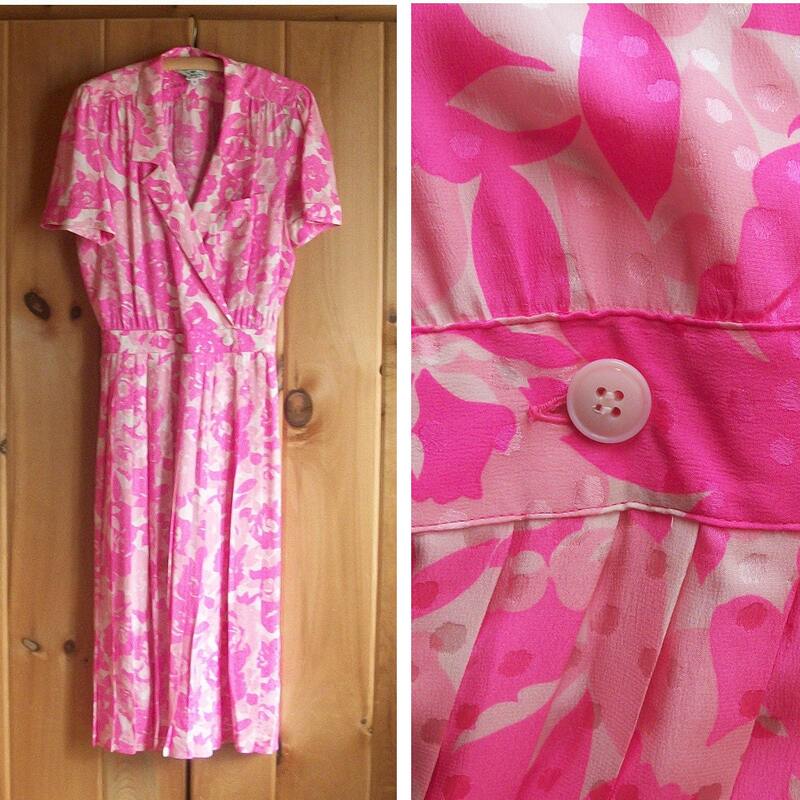 This dress is a dream; I gasped when I saw it hanging in a local consignment store, and I cursed when I realized it didn't fit me. The silk is extremely fine, the color vibrant, the condition excellent except for an inside snap that is loose. If you are a curvy gal with a narrow waist, buy this dress; you won't be sorry. This pretty lady has been in the shop since almost Diay 1. In person, she is gorgeous; the colors are so vibrant and lovely, and I love the little details like the pearlescent buttons at the back of the collar. But it wasn't until I styled the dress and put it on a dress form that her true beauty came out. At $8, this is a steal! I hope to find her a new home soon. I love how subtle and delicate the ombre effect is on this sweet and feminine maxi dress. 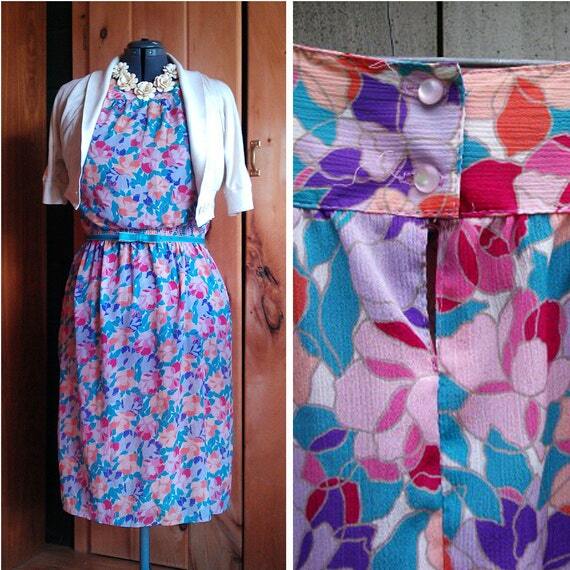 I just want to throw a little white cardigan over this and slip on some flat sandals and have it be summer, forever. I just noticed that my Facebook page is at 98 likes, and I'm really excited about hitting the triple digits. If I can get there by midnight tonight, I'll announce a major flash sale on FB tomorrow, so stay tuned! Hope you are having a lovely weekend ... it's a bit damp and gray here, but I really feel like the weather has turned and we've seen the last of the constant freezing temps. It's not exactly going to be bare-legs weather any time soon, but I am excited about some white tights I just ordered from Target (on clearance for $3.50!) ... I don't think I've worn white tights since I was, like, 12. But Rebecca of The Clothes Horse always makes them look so cute, I figured I would give them a spin too. And I'm looking forward to showcasing some more "forgotten" items from my shop in the next week or so, as well as trying out a few new pieces of my own. I can't believe it's almost April!